The Mass Spectrometry Facility (MSF) provides state-of-the-art support in a wide variety of research areas campus wide and also for the local community. Our three main duties are "service, education, and research". The mass spectrometric and analytical services include molecular weight and chemical composition determinations, structure elucidations, and qualitative and quantitative analyses of organic, inorganic and biological compounds. We are extensively involved in both undergraduate and graduate education on campus. We participate in different courses and provide help for graduate students during their Ph.D. program. We regularly offer and teach a summer workshop on mass spectrometry and we conduct a "Introduction to MS/MS" short course on the annual ASMS (American Society of Mass Spectrometry) conferences. The MS Facility is extensively involved in national and international research collaborations. 1) The Bruker 9.4 T Apex-Qh hybrid Fourier transfer ion-cyclotron resonance (FT-ICR) instrument equipped with a dual ESI/MALDI source is used with its ultrahigh resolution capability to determine accurate masses (elemental analysis, with sub ppm error) of small organic and inorganic molecules, peptides, polymers and medium size proteins and protein complexes/reaction products. Very complex, multicomponent mixtures (such as tholins) are extensively studied. 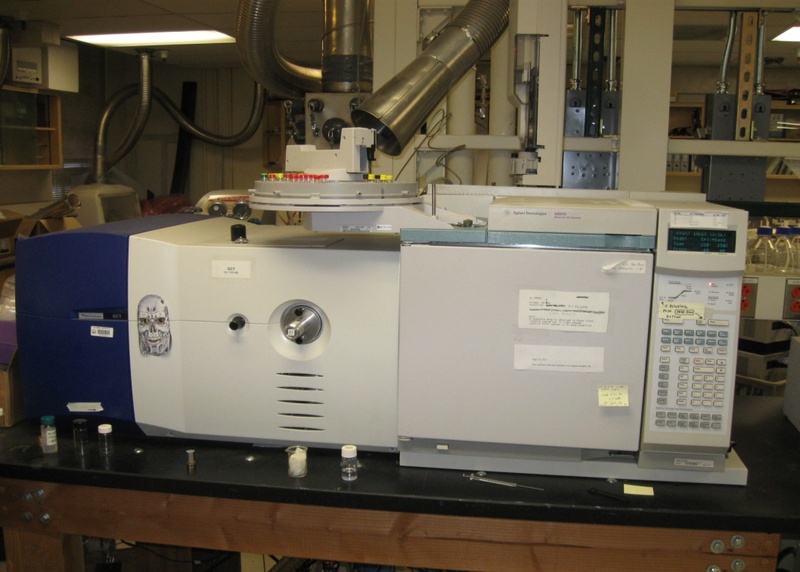 This instrument is also used to perform gas-phase hydrogen/deuterium exchange (HDX) measurements in order to distinguish structural isomers of ions. Available tandem MS/MS methods include QCID, SORI, IRMPD, and ECD. 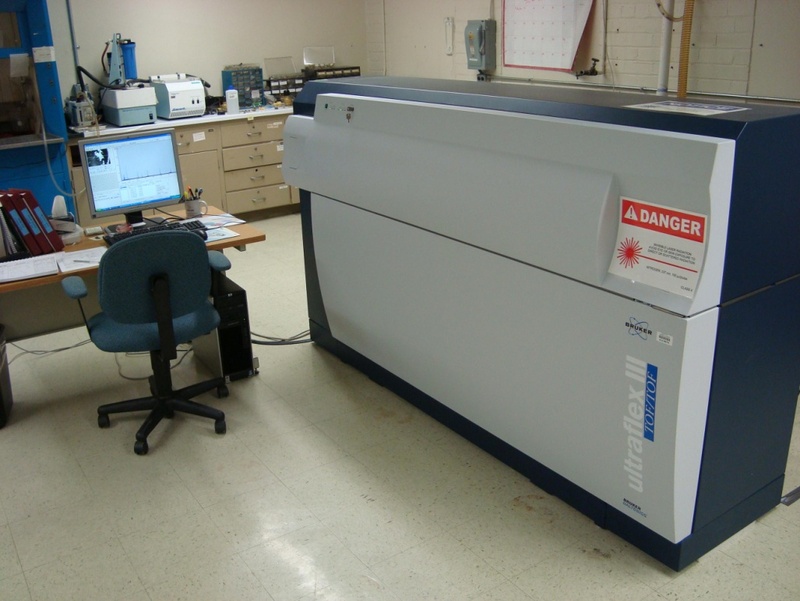 2) The Bruker Ultraflex III MALDI TOF-TOF (high resolution) instrument is used to analyze synthetic polymers, dendrimers, inorganic complexes, peptides, and proteins. Accurate mass measurements are available in the reflecton mode with ± 3 ppm accuracy. Tandem MS/MS (TOF-TOF) is used for structural elucidations. 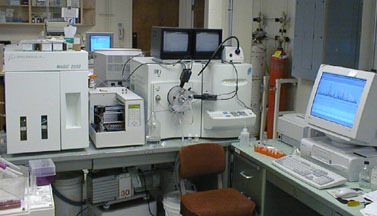 3) The Thermofisher (Finnigan) LCQ (unit resolution) instrument is used to provide molecular weight and structural information on oligopeptides, oligosaccharides, synthetic polymers, and proteins. 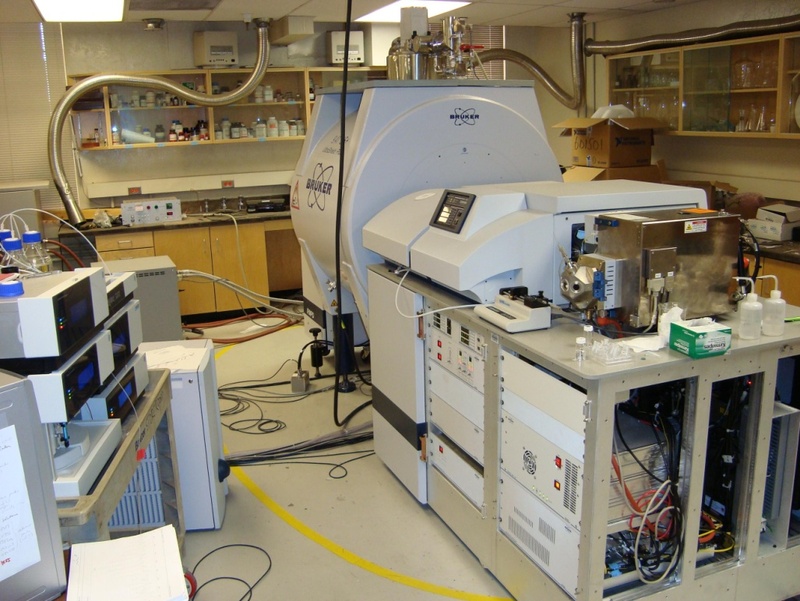 4) The Waters GCT GC-MS system is used to analyze small volatile compounds including head space analysis. The TOF analyzer allows molecular weight determination with ± 5 ppm accuracy.